Green beans may very well be one of my absolute favorite vegetables! And nothing, I mean NOTHING, beats string beans fresh from the garden. 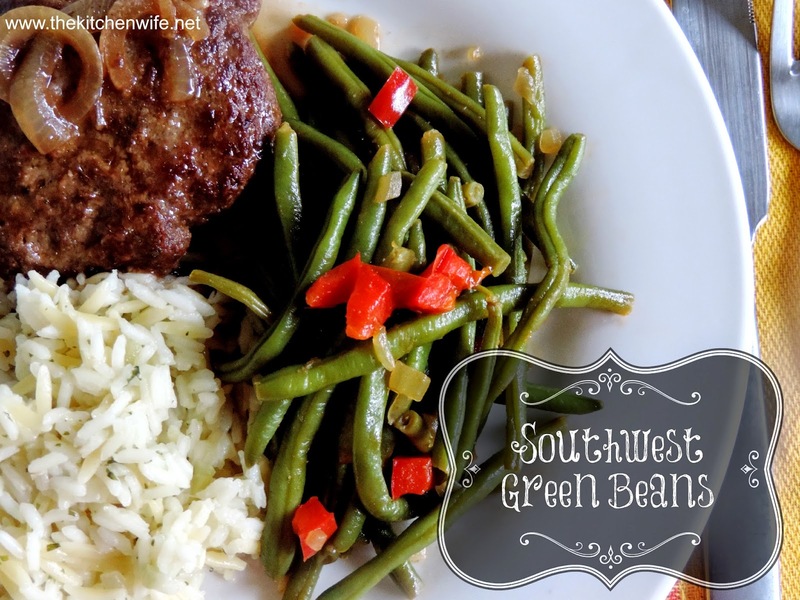 "Spice Up" your green bean hum-drum! When skillet is hot, add the onions. Next add the red bell pepper and cook until tender. Now, add the garlic and cook until you smell it coming from the pan. Time to add your green beans. Add water or stock and season with salt and pepper. Cover and allow to simmer for 20 minutes, until the beans are tender. A fresh new take on a dinner classic! I know you and your family are going to love it! I served this up with my Homemade Salisbury Steak and Classic Rice Pilaf! Place skillet over medium/high heat. When skillet is hot, add a little oil. Add the red bell pepper and cook until tender. Add the garlic and cook until you can smell it coming from the pan. Add the spices and chicken bullion, if you are not using a boxed or canned stock. Add water or stock, bring to a simmer, cover, and cook for 20 minutes.